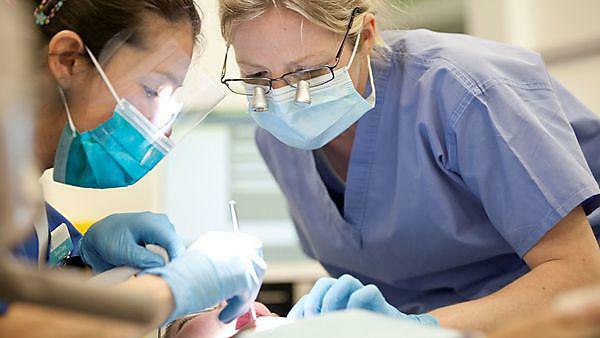 The programme is carefully structured to ensure that, as a dental graduate, you will possess the knowledge, skills, and attitudes required for safe practice and entry into your first clinical job as a Dental Foundation Year 1 dentist. Whilst the majority of the five-year undergraduate BDS degree programme can be considered ‘core’ and provides essential knowledge and skills, there are also Special Study Units which means that you are able to study, in depth, selected areas which may be of special interest to you. Effective teamwork is essential to the efficient delivery of dental care. Most of your learning will take place in small groups, which will prepare you for working in a team. Time for private study is built into the timetable, enabling you to take responsibility for your own learning by using the wide array of resources and learning support which is available. Student learning is supported by the use of study guides which develop knowledge of oral health and oral disease and its causes by working through patient scenarios, identifying the knowledge, clinical reasoning and analytical skills needed to deal appropriately with each case. This enquiry-based learning takes place in a highly supported, blended learning environment incorporating e-learning, tutorials, self-directed learning, and plenary sessions. Whether you are at the main teaching centre at University of Plymouth or engaged in clinical practice at one of the Dental Education Facilities across the south west of the peninsula, there are extensive e-learning, library and other facilities which include videos, CDs, DVDs, books, publications, access to electronic journals and facilities for telematic conferencing. You'll learn the core scientific foundations of dentistry in a clinical context. In Year Three the amount of time spent in clinics will be two days per week to continue your exposure to clinical material. Year five emphasises the practical implementation of what you have learned in years one to four and is the final preparation for dental practice.